What is SWM? What is MSW? Solid Waste Management, Municipal Solid Waste. What is Waste Segregation or Garbage Segregation? Why should we Segregate Waste? Segregation is the first step towards better SWM and a better locality/city. How much Waste Ward 174 & Ward 190 generate? Ward 174 & 190 generates about 22-25 tons of Garbage each per day, per person Waste generation is about 200-450 grams per day. What is the composition of Waste generated in Bengaluru? Where does Waste go after Collection for HSR Layout? The Wet/Organic Waste of 6-7 tons per day goes to KCDC located in Somasundrapalya. Dry & e-Waste goes to Dry Waste Collection Center (DWCC) the 24th Main, next to Bangalore One for separation and then sold to recycling units. Rejects/Debris goes to BBMP identified landfills. What are the different types of Waste? What is Wet or Organic or Compostable Waste? Vegetables & Fruits Peels, Leftover Food, Leaves, Egg Shells, Meat, Bones, Tea Bags, Coffee Grind, Rotten Vegetables & Fruits, Tissue soiled with Food, Twigs, Flowers and Nutshells. What is Dry Waste or Recycle-able Waste? Paper, Cartons, Boxes, Tins, all Plastic items, Metal items, Cloth, Tetrapak, Aluminium Foil, Runner, Glass Bottles, Balloons, Ceramic, Dusters, Scrubbers, Brushes, Thermocol, Wood, Leather, Rexine, Canvas, Ropes, Coconut Shells. What is Medical & Sanitary Waste? Sanitary Napkins, Diapers, Condoms, Ear buds, Syringes, expired Tablets. What is Electronic Waste or e-Waste? CDs, DVs, Tapes, Batteries, Charges, Unbroken Blubs/Tube lights, Mobiles, Wires. What is Rejects or Debris? a. Blades, broken Glass Pieces, Cement, Swept Dust, Pet Poop, Hair, Nails, Soiled Cloths, Construction waste, Ashes, broken Plant Pots, Fireworks/Crackers waste, Cigarette butts. 13.How do I dispose Bouquets? To dispose Bouquets, first separate flowers and leaves and put in Wet Waste and rest i.e sponge, wire etc in Dry Waste. Oil can be disposed directly into the drain, in case of Gravy it can be strained out into the drain and the put in the Wet waste bin. How many Bins should we have at home? iv. Note: e-Waste can be given it in the Recycle-able Waste in a separate cover. Can I give Wet Waste in Plastic Bag, because Bin will become dirty? No, please do not give Wet Waste in Plastic Bag, layer the bin with newspaper, and remove/drain excess water in the Waste and put it in the bin directly. Newspaper will ensure the bin stays clean. Once the Wet Waste is taken, rinse the bin and use. How and when is Waste/Garbage collected? Wet & Reject Waste is collected 5 days a week, and Dry Waste is collected twice a week (Wednesday & Saturday). If your collector is mixing Waste or not collecting Waste please inform BBMP Health Officer Mr Mahesh 9902347688 or HaSiRu Mithra hasirumithra@gmail.com. Is Waste/Garbage collected Door-2-Door even in Apartments? No, Waste is not collected Door-2-Door in Apartments, you have to leave the Waste at a common place designated or as suggested by your RWA, the Collectors will then collect it from the common place. 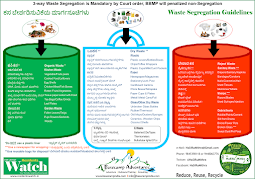 Is non-Segregation of Waste punishable? Yes non-Segregation is punishable; non-compliance will attract penalty from BBMP. Should I/We pay money for the Collector? No, do not pay any money for the Collectors; they have a contract with BBMP for collection. If the Collectors demands money please inform BBMP Health Officer. But if you live in an Apartment please check for the BBMP rules/guidelines on Waste collection with your RWA or with BBMP Health Officer. Whom should I complain if Collector does not come regularly? If the Collector is not regular you can complain to the BBMP Health Officer or HaSiRu Mithra. Can we process our Waste at Home/School/Apartment/Restaurant? Yes you can do Composting at your Home/School/Apartment/Restaurant there are small & medium scale option for Composting, compost can be used for the plants and trees in the garden. Wet Waste can also be converted into Bio-Gas, which can be an alternate cooking fuel. These solutions are cheaper, simple and are readily available. How much money does BBMP spend Garbage Management per year? BBMP spends over Rs 300-500 Crs per year on Garbage Management; Bengaluru spends more money on SWM than any other city. Segregation and better collections can reduce the cost by Rs 200 Crs per year. Will Dry Waste smell if I store it for a week? It will not smell if it is clean and dry, make sure that plastic sachets of Milk, Curds, Oil, Idly batter and any other food item are cleaned of contents and dried before being put in the Dry Waste bag. If I order take away from a local hotel do I have to rinse the plastics bags/containers? Yes, any plastic containing any food has to be rinsed with water and dried before being put into the dry waste bag. How do I dispose dog/cat poop? Wrap the pet poop in a newspaper, and put it in the Debris/Rejects bin. I have never touched waste in my life, I find it too yucky. Don’t worry, we all do it yucky! Please use disposable rubber hand-gloves, use them 3-4 times and throw used hand-gloves along with other rejects. My maid disposes off waste in my house and she mixes all the waste. What do I do? Please train your maid on waste segregation practices or check with your apartment if they offer any training. If you don’t speak Kannada and have any difficulty in explaining to your maid, then please encourage her to attend the training programmes organised by HaSiRu Mithra or any other organisation in your locality. I don’t have time to line my bins with paper or clean all food packages before putting in Dry Waste bin, what do I do? Lining your bin with a newspaper does not take much time and saves time later as you don’t have to clean your bin often. Please try it once and see. Leave all your packaged food containers in or near the kitchen sink and ask your maid to rinse them once. You can also re-use all plastic containers; you can even grow plants in them. I have dependent parents/grand-parents/in-laws and children in my house and find it difficult to enforce all these practices. What can I do? Ideally, the bins should be placed in the locations where you generate waste. For example, if you have old people or babies who use diapers, place a rejects bin in the room where they stay and line it with a newspaper, so that it is easy to handle used diapers. If there is a lot of food waste generated in the children’s bedroom, then place a small Wet Waste bin in that room and another bigger one in the kitchen. I already pay my taxes, BBMP should I be Segregating Waste, Why is BBMP putting the burden on me? Sadly, we have not been managing waste properly in India and we are realising now only when it has become too difficult to manage. Segregation of waste is the norm in most countries across the world. As Citizens we have a responsibility towards Environment Management, we must not only keep our houses clean and tidy but also be concerned about also about our neighbourhood. A Clean Environment leads to a better Health and better Living conditions to everyone. We as Citizens should follow the guidelines of the Civic Authorities at all times.